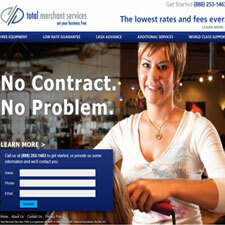 Total Merchant Services Reviews - Is it Right For Your Business? Total Merchant Services offers merchant accounts with a focus on low rates which they claim is the most competitive in the merchant account industry. Accepting the major credit cards and partnership with merchant account equipment manufacturers enables TMS to put create a custom system of point of sale terminal capabilities, online credit card processing software, and other services to best meet your business payment needs. They offer the standard in fraud protection and security needs for transaction processing and have a marketing focus on their customer service and support for their merchant account services. For Ecommerce TMS offers a variety of plug n play solutions for credit card processing and integration. If you need wireless credit card capability they can provide options for those payment needs as well. A publicly traded merchant account company with a focus on service and support. The absolute worse credit card processing company. A total fraud. This company comes up with a bunch of different excuses not to depodit credit card batches to your account on time. Damon Broussard in the loss prevention department is a condesending jerk who accused me of dishonesty after being in business for over 25 years. Do not do business with these ripp off artists and snake oil salesmes unless you are ready to endure major heartach and detrement to your samll business. Nothing but problems backed by poor customer service! Long wait times on the Customer service # as well as unexplained fees, late money deposits, and fees for the most basic account services such as change of address! I do not recommend them!